THEY ARE THE ANGELS of rural Minnesota. The volunteer firefighters. The volunteer first responders. The volunteer ambulance crews. If you don’t believe me, then spend some time in a place like Vesta, population around 330, on the southwestern Minnesota prairie where I grew up. In small towns like this, the nearest clinic and hospital are often a 20-mile drive or more. My mom still lives in my hometown and, because she’s getting up there in age, I worry about her. But that concern is offset somewhat by the knowledge that first responders will come to her aid in a medical emergency. And they have. So when I read an article in the December 16 The Gaylord Hub, a community newspaper where I worked decades ago right out of college, I knew I had to share a story by reporter Lisa Uecker. She wrote about an ambulance trip from Gibbon to New Ulm during the December 11 blizzard. Uecker is graciously permitting me to retell that story here. It’s worth your time to read for the lessons it teaches in dedication and care and how those in small towns will go the extra mile to assist their friends and neighbors. In this instance, the miles, literally, were extra and a trip which should have taken perhaps 30 minutes became a 3 ½-hour ordeal. The incident begins at 2:30 p.m. on Saturday, December 11, during the height of the two-day blizzard. The volunteer Winthrop Ambulance Service receives a call to Gibbon some eight miles to the west. Once the crew reaches Gibbon and the patient, they backtrack to Winthrop knowing they must travel the longer, but safer, state highways rather than follow the shorter route along county roads. From Winthrop, they are headed 16 miles south along Minnesota State Highway 15 to the hospital in New Ulm. A paramedic intercept is impossible, the crew learns, so snowplows are dispatched to meet the ambulance at the intersection of Highway 15 and Nicollet County Road 1 near Lafayette. One plow goes into the ditch. Another is low on fuel. The third has mechanical problems. None of the plows make it to the appointed rendezvous site. 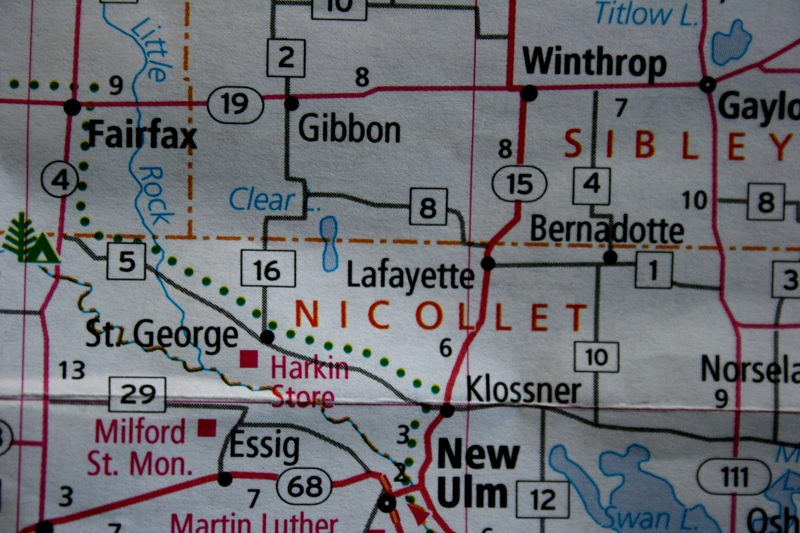 If you're unfamiliar with Sibley and Nicollet counties, here's a map photo to show you the roadways and towns highlighted in this story. The ambulance crew is on its own, traveling in white-out conditions near Klossner. The rescue vehicle soon becomes stuck on the shoulder. Because snowplows have been pulled off the roads, the Lafayette Fire Department comes to the rescue, freeing the ambulance with its pumper truck. After passing Klossner, the ambulance gets stuck again, but the driver–ambulance captain and assistant Sibley County attorney Donald Lannoye–is able to rock the vehicle free. Finally, at 6 p.m., the patient, who has been stable throughout the ride, is delivered to the New Ulm Medical Center. The four-member volunteer ambulance crew spends the night in New Ulm. In an interview with reporter Uecker, Lannoye says that once he passed Sibley County Road 8 right outside of Lafayette, he could never drive more than five miles per hour due to poor visibility and road conditions. The crew saw 11 – 15 cars in ditches and 4 – 6 cars stuck in traffic lanes near Lafayette. Then Lannoye also reveals that his crew began their day at 5 a.m., transporting a patient on icy roads to Hutchinson. If ever there was an outstanding example of the care and concern residents of rural Minnesota have for each other, then this would be it. We should all be thankful for volunteers like Lannoye, ambulance crew members Lisa Klenk and Todd Storms, EMT-in-training Katie Uecker and Lafayette Volunteer Fire Department members who braved a blizzard to help their neighbors. They are, indeed, snow angels. IF YOU HAVE A STORY to share about how volunteers have helped you or someone you love, submit a comment. I’m certain there are many such stories out there. I live in Tyler & u are right on. These workers are true heroes and the best of citizens. I’ve helped others and I have been helped by others. It is amazing what strength people can reach for in times of emergency. References to “A New York Minute” claim the dangers of the big city, and I agree, but nothing equals nature’s wrath. The danger of going off road and freezing, even for a crew of people, cannot be underestimated. Death is there waiting–without any malice intended to anyone. Nature is neither threat nor solace. It just is.